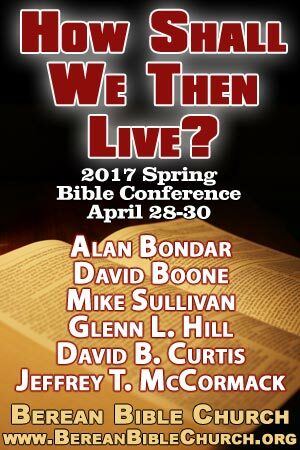 The April 2017 Bible Conference media set allow you to get a copy of the lectures on an MP3 audio disc, or grab the DVD set to watch the lectures. The DVD set also comes with the MP3 disc as a bonus, so you can listen or watch the event. Discover why Christ had to leave His physical body behind when He ascended into Heaven. We'll follow the journey of Christ through the veils of the Temple as He ascends the hill of the LORD. The glory of the New Covenant is vastly superior to the glory of the Old Covenant (2 Cor. 3). And that means seeing the glory of God in the New Covenant is vastly superior to seeing the glory of God in the Old Covenant. Find out what the Bible teaches about how to see the glory of God in our lives today. A survey of Old Testament Types & Shadows that find their fulfillment in the Kingdom of God, which is the gospel. A look at what it means to "live by the book" as a "radicalized" Christian (being doers of the Word as we live life in the Kingdom). An historical overview of: 1). Islam's violent "the end is near," "in the land," "holy war" eschatology; 2). "Jewish" Zionism's "end time," "in the land," "holy war" eschatology; and 3). Dispensational Zionism's "the end is near," "in the land," "holy war" eschatology. Demonstrating from the Scriptures the following: 1). The Bible teaches that the end of the Old Covenant age was "near" (not the end of world history) in AD 70, 2). The Bible teaches that there is no longer any "Jew" or "Gentile" today under the New Covenant age and that Old Covenant categories of being "in the land" or inheriting a new world order have been fulfilled by being "in Christ," and 3). The end time "holy war" (Gog and Magog, Armageddon, Jerusalem being surrounded by armies, etc.) was fulfilled between AD 66 - AD 70. In the kingdom, we get to be free from The Law, free from trying to earn our salvation by our good works, free from condemnation, and free from guilt. As a result, we get to enjoy the righteousness, the peace, and the joy that is the kingdom of God. What does the Bible have to say about sanctification past AD 70? Are we still battling with evil spiritual forces today? Can the doctrine of universal reconciliation stand up against a proper contextual and cultural view of Scripture?.